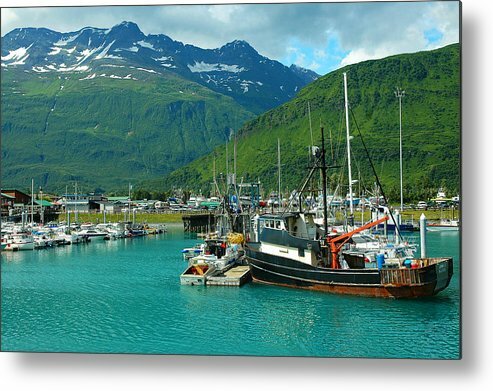 Valdez Harbor by Nick Boren - 10.000" x 6.625"
Valdez Harbor metal print by Nick Boren. Bring your artwork to life with the stylish lines and added depth of a metal print. Your image gets printed directly onto a sheet of 1/16" thick aluminum. The aluminum sheet is offset from the wall by a 3/4" thick wooden frame which is attached to the back. The high gloss of the aluminum sheet complements the rich colors of any image to produce stunning results. Nick, Nice shot of Valdez.. gorgeous colors.. Voted, favorited! Lovely! Thank you Kym... 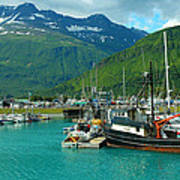 I'm glad you like this harbor shot at Valdez. :-) I also appreciate your vote. Gorgeous water, blues, beautiful capture, f/v. Thank you Karol... I'm glad you like it. Thank very much Mary... I thought you might like this one. ;-) I appreciate your vf also. Thank you so much Heidi... I'm glad you like it. This area is the most beautiful place I have ever been and I have been to many. :-) I appreciate your f/v/tw... thanks so much. I don't think there is a more beautiful place on earth than Valdez Alaska. If there it I have not been there. I have never been to a place where the rugged mountains come right down in the sea. 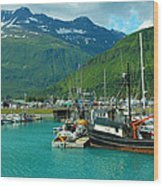 Valdez has that and more!